Relax. Mobile entrepreneurs are jumping into the pet industry with smartphone-enabled gadgets that can help care for your four-legged friends, from activity trackers to a litter box that cleans and refills itself. Among countless new "wearable" gadgets presented this week at the Mobile World Congress trade fair in Barcelona were monitors that attach to dog or cat collars. The devices allow owners to track their pet's location and activity levels - for example how long they have walked, run, played or slept - on a smartphone, as well as check that a dog walker is exercising the animal enough. Some even allow owners to set up a safe zone around their home on the app and receive alerts when their pet moves outside of the fixed area. Vodafone, the world's second largest mobile operator, displayed its tracker called Kippy, which is available across Europe, at the fair. The waterproof device is made of steel and is powered by a rechargeable battery that lasts up to 10 days. It works with a SIM card with a monthly subscription of EUR 4-6 per month. "It's about having an enhanced relationship with your pet," said Vodafone spokesman Steve Shepperson-Smith. The push into wireless gadgets for pets comes amid slumping sales for smartphones. Worldwide shipments of smartphones declined 4.1 percent in 2018 to a total of 1.4 billion units, the second straight yearly decline, according to research firm IDC, as people hold on to their devices for longer due to a lack of major innovations. "On the assumption that almost every human in Europe that wants a phone already has one, Vodafone is smart to consider connecting pets," said Ben Wood, an analyst at tech research consultancy CCS Insight. "The pet market is an incredibly lucrative segment that has been steadily growing year-on-year." The global pet wearables market will surpass $8 billion by 2024, up from $1.85 billion in 2017, according to Global Market Insights. "Pretty much anything that moves can have a wearable on it. Human wearables are very popular and it is a logical extension that companies move to pet wearables as well," said Neil Mawston, an executive director at research firm Strategy Analytics. He estimates there are 300 million cats and dogs worldwide living in domestic homes. "That is a relatively large base to try to sell products to. They are effectively taking the tech that is used for humans and taking it across to pets," said Mawston. For those who miss their pet while away, several firms have put out wifi-enabled cameras that allow owners to monitor their dog with their smartphone. One of the most popular, the Furbo, stores treats inside and allows the user to hit a button on their phone to toss the treat. The device can also send you a text alert if your dog barks a lot and compiles a 60-second video compilation of all of your dog's daily activity. 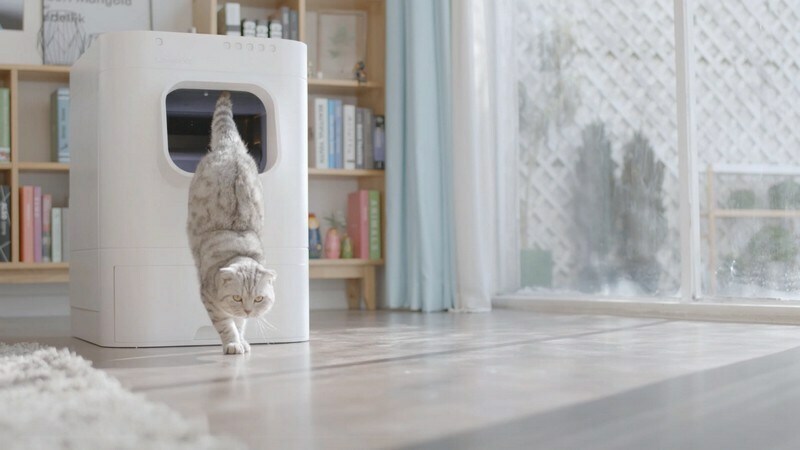 South Korean startup PurrSong displayed a smart automatic litter box called the LavvieBot which auto-cleans and auto-refills. After your cat does its business inside the machine, LavvieBot noiselessly pushes a rake through the litter before hurling a few handfuls of clean litter. It can even send you text notifications when your cat uses the toilet, and track a cat's weight as well as the duration, length and times it uses the litter box to detect possible health problems. "Anything abnormal it will report right to your smartphone," said PurrSong marketing manager Heaven Nam. "Owners don't have to cancel their travel plans and cut costs on cat hotels or cat sitters if they need to travel."